Follow the red arrows and green distance markers for a two lap run around the hill tops over looking Bath. The course is gently rolling and looks over to Bannerdown Hill and Little Solsbury Hill at the 2.5km mark. The route comes in almost exactly on 10km. Follow the orange distance markers to the 14.5 mile point (where the marathon U turn point is, and Half Marathon goes straight on), and then pick up the blue distance markers to the finish. 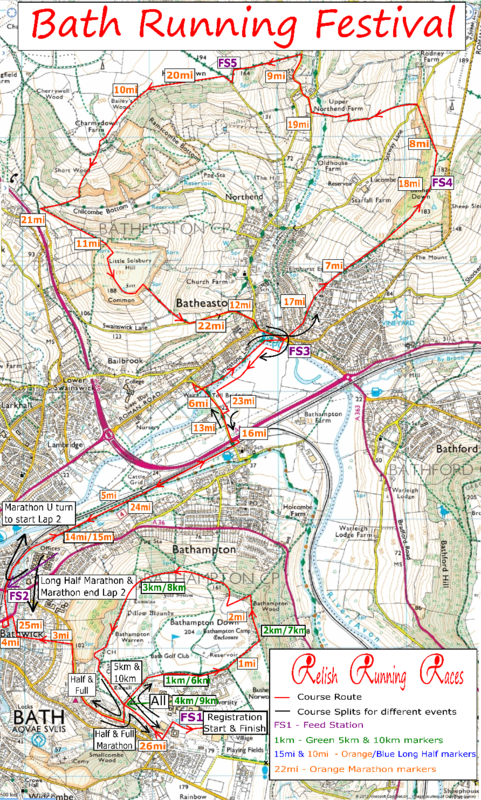 This course takes in some of toughest hills in Bath; the original Roman Fosse Way (first purple section - straight up! ), down into St Catherine's Valley and up a lane which locals assure me was once a road (second purple section), a little climb up to Little Solsbury Hill at 13km, before a final climb back up to Sham Castle at the end of the course. At the top of each of the hills, beautiful views await, each offering a unique aspect of Bath and the surrounding valleys. This generously long half marathon course, has a suitably lengthy amount of climbing, with an elevation gain of 675m (2215ft) over 26km. Follow the orange distance markers for this (nearly) two lap course. The Bath Marathon is a very hill affair indeed. Runners follow the half marathon course as described above, but make a U turn after 14.5miles on the Kennet & Avon Canal, to tackle Bannerdown and Little Solsbury hills for a second time, before completing this epic run up North Road after 38 hilly kms. This accurate off road marathon course has 3,350ft (over 1,000m!) of climbing.